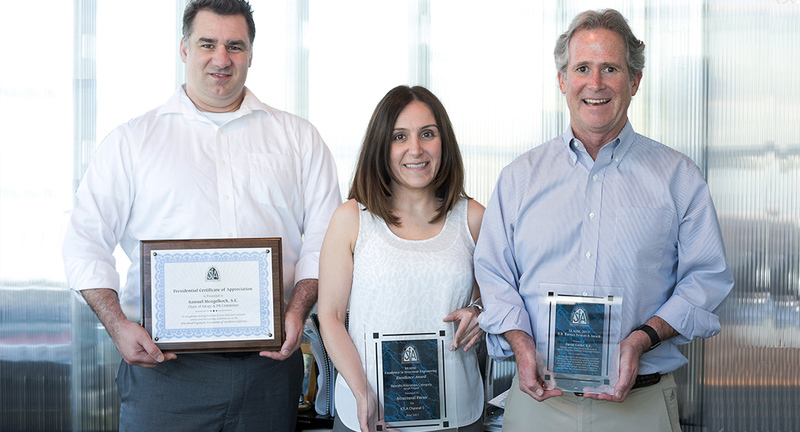 Los Angeles-area, CA, June 14, 2017 — Structural Focus members received awards during last week’s Structural Engineers Association of Southern California (SEAOSC) End-of-Year Awards & President’s Dinner. SEAOSC President Jeff Ellis granted the S.B. Barnes Research Award to Structural Focus President David Cocke, SE and the Presidential Certificate of Appreciation to Structural Focus Associate Samuel Mengelkoch, SE. Structural Focus Associate Samuel Mengelkoch received the Presidential Certificate of Appreciation in recognition of his dedicated volunteer service and outstanding contributions to the organization. 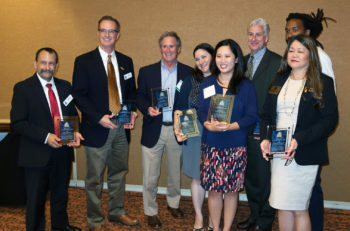 “While it is a real honor to be recognized by the SEAOSC President, the true reward is seeing the committee make progress toward our goal of raising the profile of the profession,” expressed Mr. Mengelkoch. He has been a SEAOSC member since 2004 and joined the Image and PR committee in 2014, he is currently the committee’s Chair. Structural Focus also received an Award of Excellence in the Seismic Retrofit – Small Project category for the renovation of KTLA Channel 5 accepted by Project Engineer Melineh Zomorrodian, SE. To house KTLA Channel 5, Sunset Bronson Studios – Stage 6 went through a major upgrade designed by Bastien and Associates and Structural Focus. The 75-year-old building presented unique challenges for the design team. The renovation required innovation, creativity, and teamwork. Click here for further details.